Following the news of Osama Bin Laden’s death the Sunday before it was time to finish up the visual tour of the Pentagon’s September 11 Memorial. The raw material was shot on a nice evening in May 2009. Peter Roof produced, photographed, and edited the program. On September 11, 2001, terrorists crashed Flight 77 into the Pentagon, killing the 59 passengers on board the aircraft and 125 military and civilian personnel who were working inside the Pentagon. 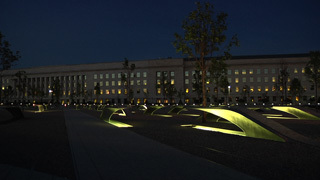 The Pentagon Memorial park consists of 184 memorial units, each of which are dedicated to an individual victim by its unique placement within the collective field. The "terrazzo" finish of each memorial unit rises dramatically from the ground on one end, and on the other end hovers over a small pool of lighted water in the surrounding gravel field of the park. Each unit has a specific directionality to distinguish victims on board Flight 77 from victims within the Pentagon. The simple but elegant memorial units are at once a glowing light pool, a cantilevered bench and a place for permanent inscription of each victim's name. The interplay between the flowers of surrounding crape myrtles, the crunch of gravel underfoot, and the water flowing under each bench provides an experience in the park that is touching and moving, one that creates a place of peace and remembrance, and allows for individual interpretation by each visitor.